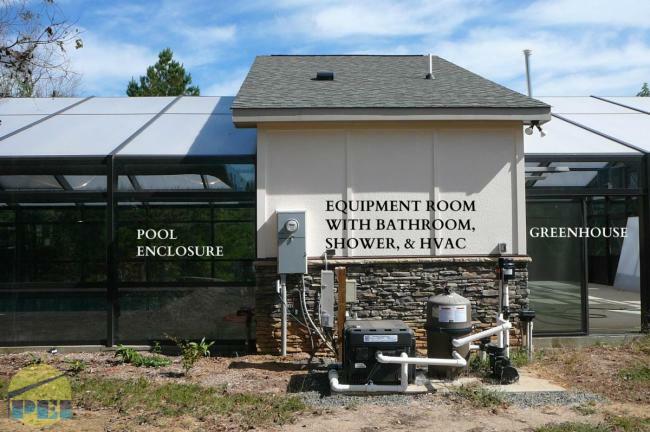 Below are just some of the swimming pool enclosures manufactured by Pool Enclosures, Inc.
A recently completed gable shaped pool enclosure adjoined to a new equipment / bath room. 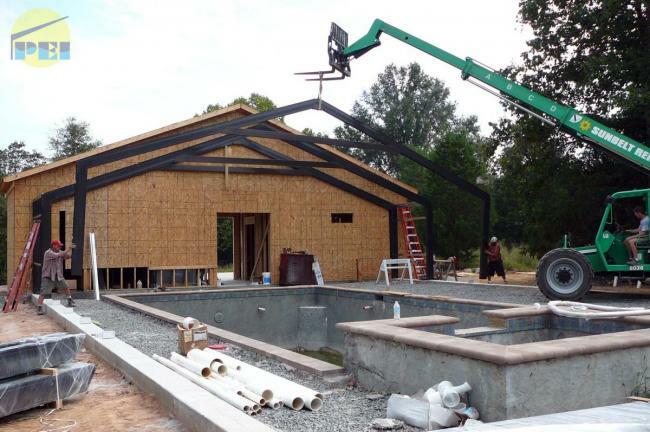 The attached wood-framed room was built by the owner's contractor and will house the pool equipment, dehumidification unit and a bathroom. 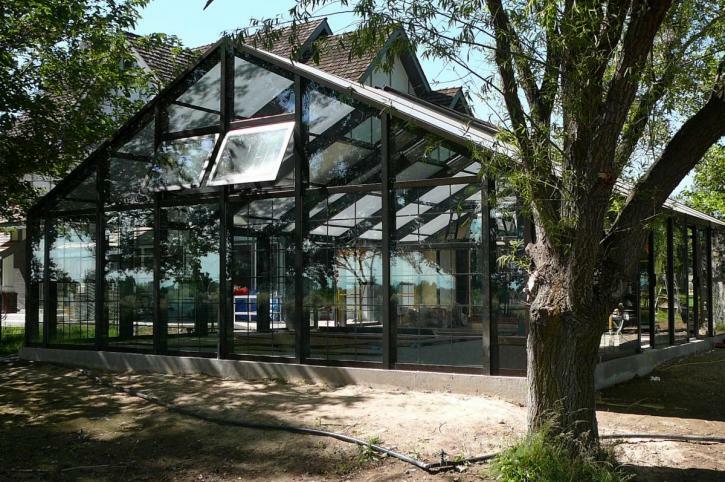 This is an ideal way to provide ducted-in heat and dehumidification into the enclosure. Instead of aluminum or gavanized ductwork the owner opted for fabric duct-sox that blends well with the colors of the enclosure. The pool enclosure is 30 miles north of Durham, NC. 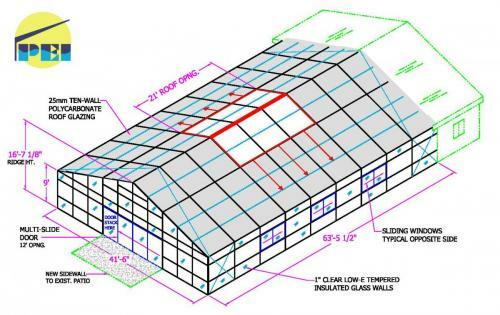 and also includes a horticultural greenhouse attached to the opposite side of the equipment room. 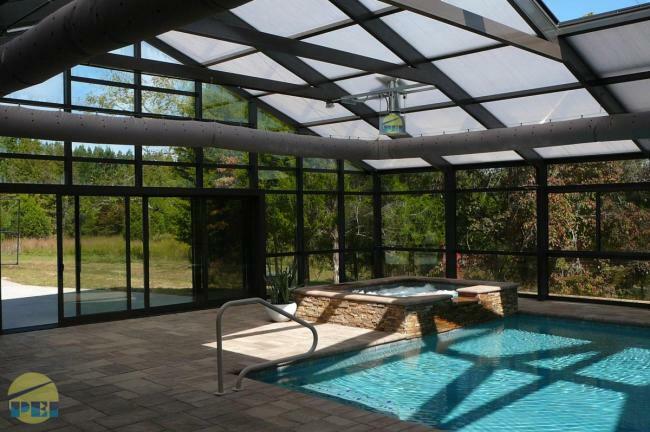 A gable-attached pool enclosure is the best method when considering dehumidification, equipment rooms and bathrooms. 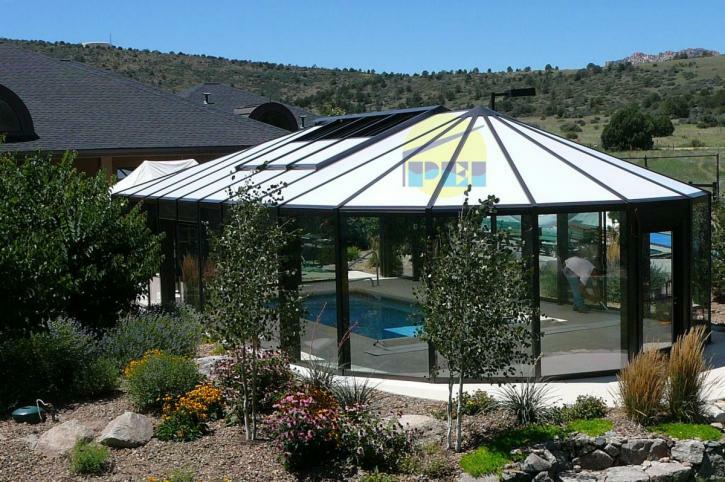 Swimming pool enclosures manufactured by Pool Enclosures, Inc. meet or exceed all local snow and wind load requirements. Structures are supplied with P.E. stamped drawings for each state. 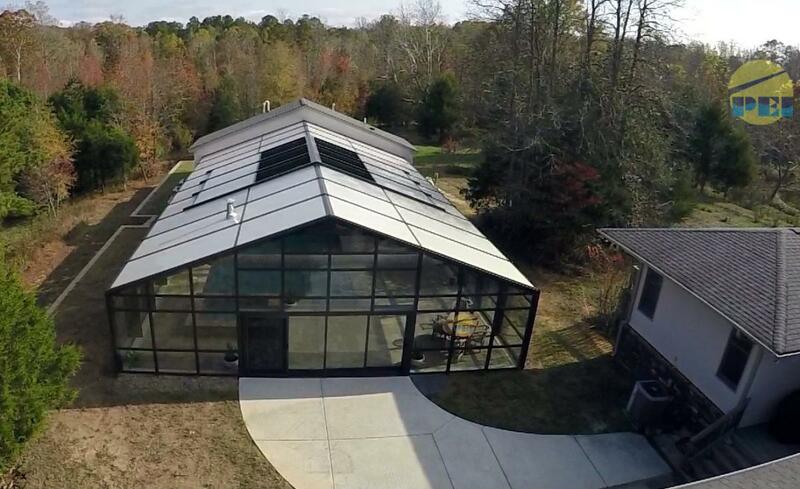 Don't compromise on light weight or non-engineered structures that insurance companies won't cover. The above structures were engineered for high snow, wind, and seismic loads. 28' wide gable end (above) of a swimming pool enclosure with dark bronze baked enamel painted framing. 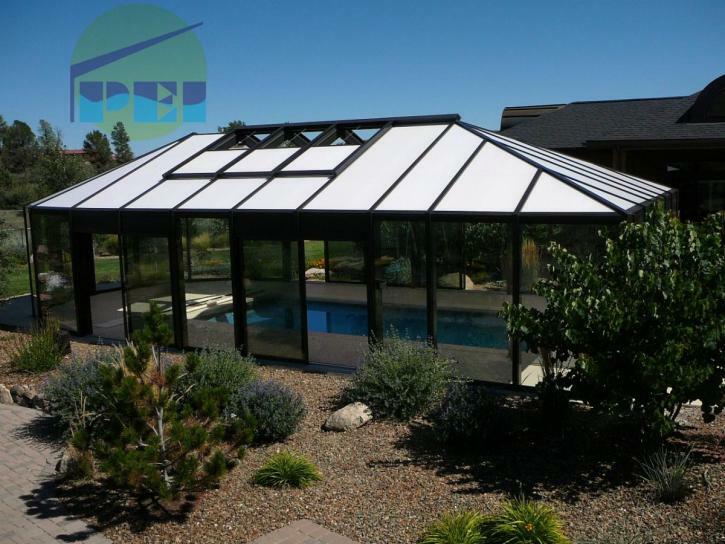 Above is a 25' wide hipped roof swimming pool enclosure with dark bronze baked enamel paint and opal polycarbonate roof glazing. Exterior & interior of faceted (segmented style) roof swimming pool enclosure with retractable roof and commercial 36" HDCP accessible swing door. 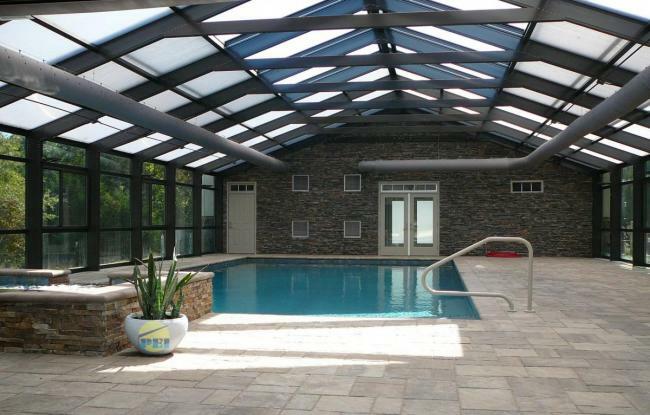 The structure covers a 12' wide therapy pool. Accessories include: lights, ceiling fans, stainless steel hanging gas heaters, awning windows, and sliding glass doors. 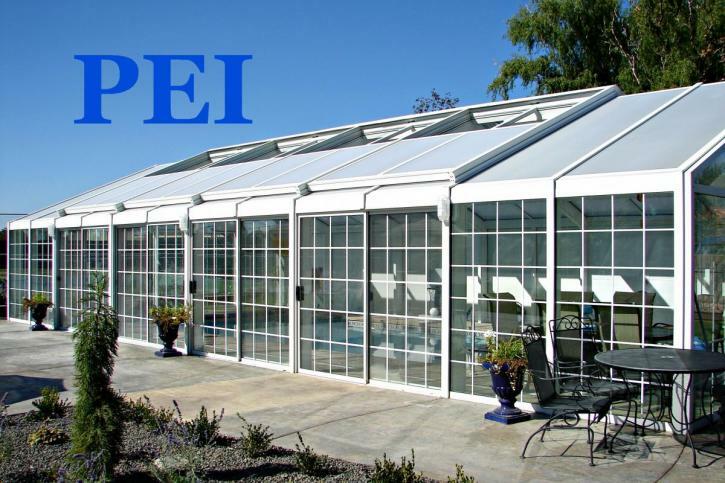 The PEI enclosure is a clear-span, glass or polycarbonate-clad aluminum structural sloped-glazing system offering total configuration flexibilty. 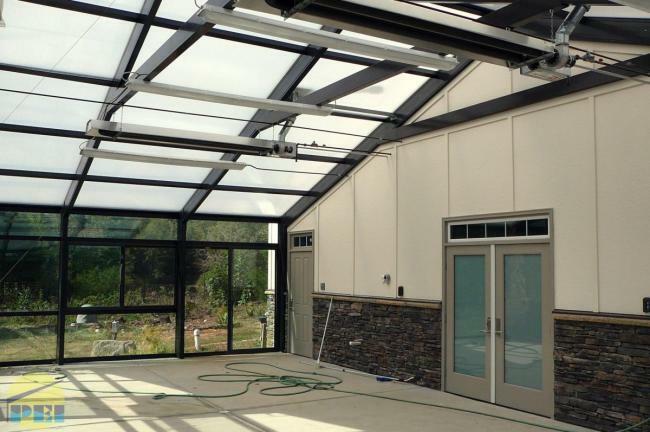 Our structures offers custom bay spacing and roof pitches (slopes) and retracting roof panels. 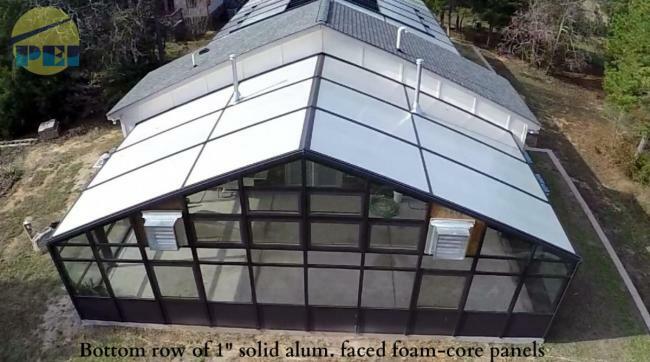 All interior components have been thermally isolated (broken) from exterior elements, and the entire system features a positive drainage weep system to channel both condensation and any water intrusion to the exterior of the structure. Systems that don't have this design incorporated into them are subject to water infiltration. The frame work is of heavy wall tubular or solid extruded aluminum alloy 6061-T6 or 6005-T5 with a baked enamel white or bronze finish, custom colors are available. 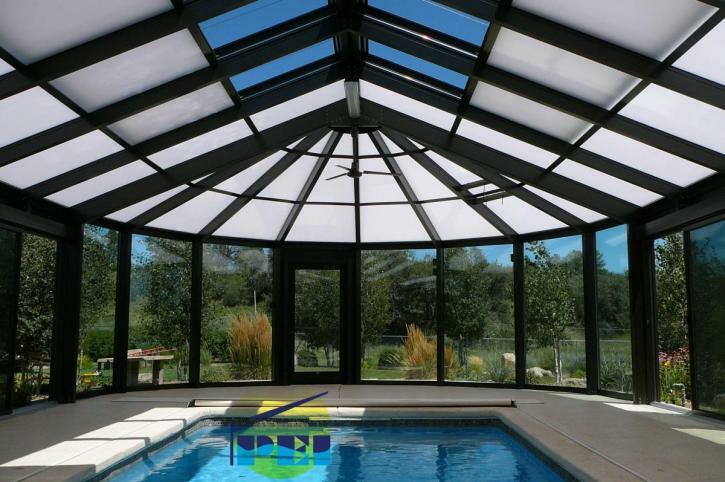 Glazing supports are provided with the required edge clearance which adequately compensate for thermal movement caused by temperature variations. 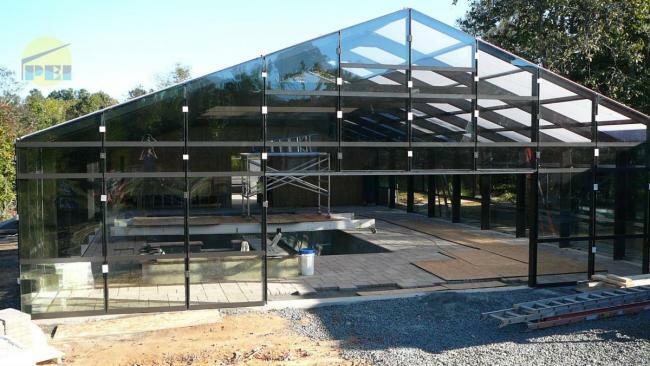 The glazing is fully supported on all four sides against both positive and negative (suction) loading. On sloped surfaces the lower edge support on the purlin prevents glass slippage. 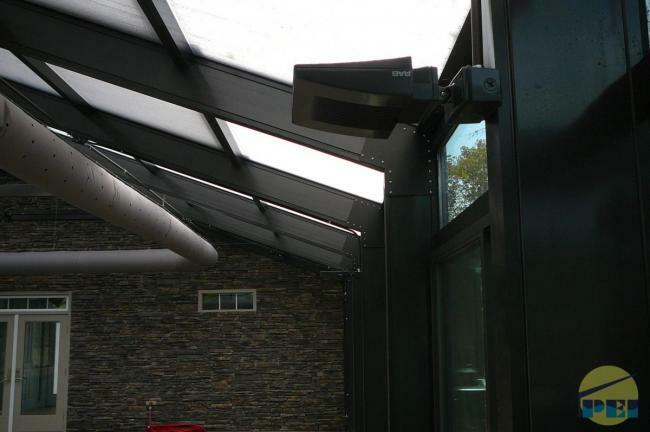 The horizontal purlins in a vertical wall application is designed to eliminate capillary action. The system is designed to support ground snow loads of 40 psi. Depending upon the configuration of the specific unit, greater snow loading can be accommodated. 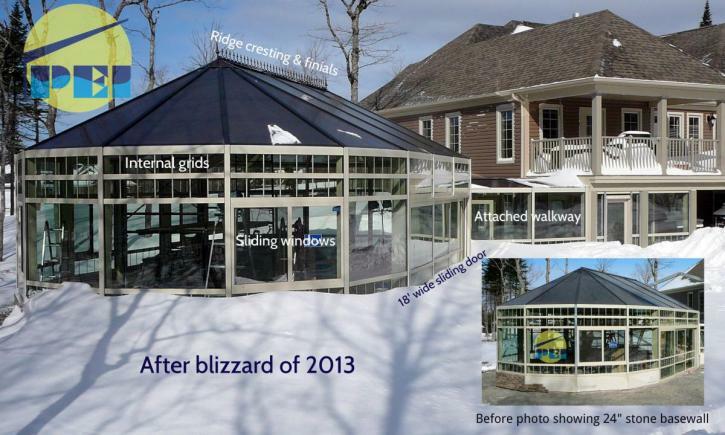 All structures are designed to withstand a minimum basic wind load of 20 psf in conjunction with snow loads. Maximum allowable deflection of all structural members shall not exceed L/180 of the clear span. 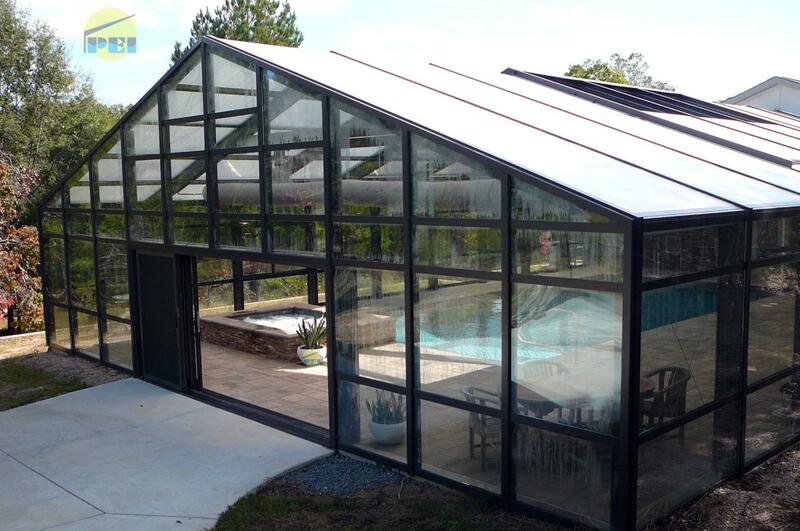 Pool Enclosures, Inc. based in Western NC., has the technical expertise and experience manufacturing swimming pool enclosures, sunrooms, greenhouses, atriums, spa enclosures, conservatories and other glazed structures, coupled with the competitive pricing, high quality innovative product and installation experience, to assure you that your project will ultimately produce a magnificent end result.